Ever since my 'feel good' resto, Cafe Othello closed down decades ago. I've never found a restaurant that has replicate that sense of joy I felt whenever I dined out. It was more than just the great food, service or ambiance, it's an inexplicable warm feeling that whenever you dine at that place you always feel welcomed whole heartedly. Just recently, I've found my new 'feel good' resto, Cafe De Paris. When we entered, we were greeted and led to our seats by Jean-Louis, the owner of Cafe De Paris. I also automatically took notice of Chef Christophe, who was in the kitchen, he had a calm and relax demeanor while cooking. The resto had a very casual relax vibe, everyone inside was holding glasses of wine with smiles on their faces. I browsed the menu and decided to order the special tasting menu for the day, the main theme was duck. 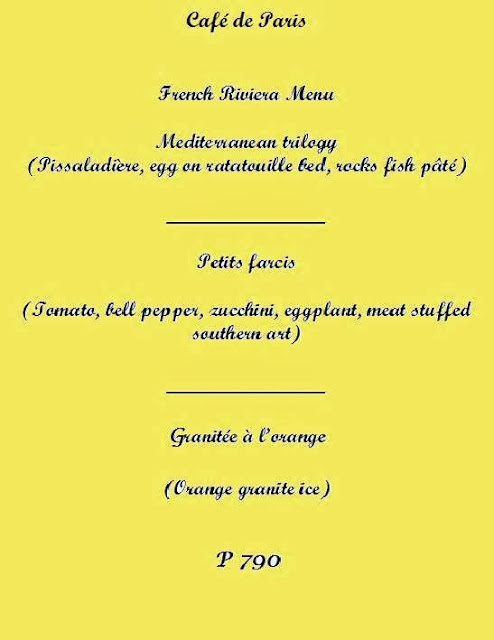 The dinner set cost Php890. A complimentary basket of the most delicious baguette was served. I haven't tasted baguette like this before in bakeshops and bread stores in Manila. The baguette had a crunchy crust with a dense, soft and chewy center.I asked both Jean and Christophe if the bread are Eric Kayser's, they just both smiled and said it's a secret. They said the bread came from France and we can't find those baguettes in Manila. 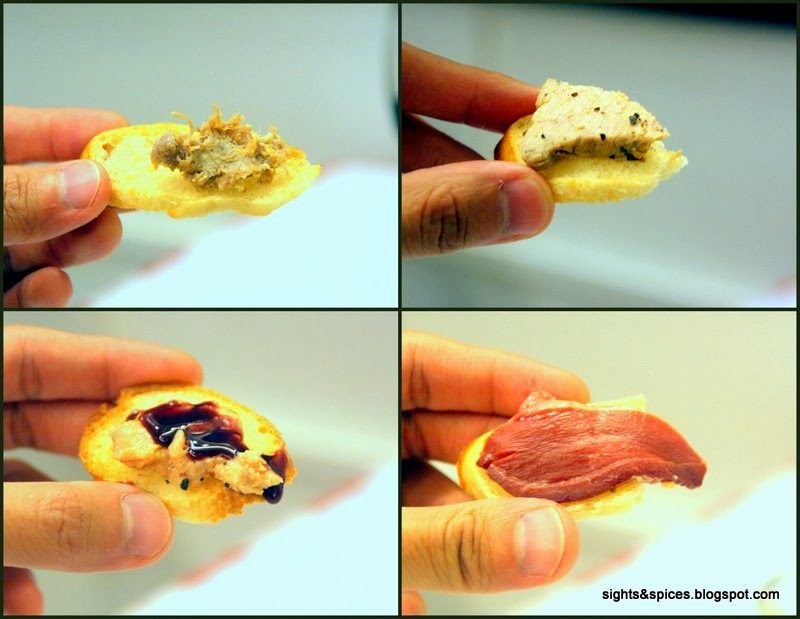 For the amount, I really didn't expect much then came the first course, Duck Pate, Foie Gras and Smoked Duck Fillet. On a nice and warm plate were three slivers of duck fillet, foie gras terrine, duck pate, mangoes, fruit berry syrup and pieces of crostini. The dish was presented simple and straightforward. As I took a bite out of each starter, I was speechless. Only the sounds of oohss and uhmss came out. Everything was delicious, I liked how smooth the terrine was, I enjoyed the smokey flavor of the fillet and the duck pate was absolutely superb. I also like how the duck starters were served together with the mangoes and fruit berry syrup. The sweetness of the fruit and syrup compliments the rich and slightly salty flavor of the duck starters. For the main course was Duck Breast with either an orange sauce or foie gras sauce. Still dazed over the starter, I went for the foie gras sauce. Just like the starter, the dish was presented straightforward, a huge chunk of charred duck breast sits on a golden foie gras sauce with mashed potato on the side. I cut the duck breast in half and what greeted me is a gorgeous pinkish center. Charred on the outside and pinkish center, duck breast was cooked to perfection. The foie gras sauce is so rich and tasty that I wanted to pick up the whole plate and slurp the whole thing down. I rarely see duck breast being served like this in restos here in the metro, I don't even remember even trying one here. If you're someone who loves a juicy piece of steak, this is a must try. For dessert, Christophe personally brought out the Fondant Chocolate Brulee. The chocolate molten cake was served with fresh orange slivers on the side. Christophe told us to break the brulee in half and as I did, a glistening gooey chocolate oozed out. I'm really not a fan of chocolates but this is one chocolate dessert I wouldn't mind eating over and over again. The cake had a slightly crunchy crust and it went so well with the creamy center. It wasn't clawing sweet and I loved how it tastes of dark chocolate. Christophe said that he used 70% dark chocolate and he's concocting up a fondant chocolate brulee with chillies, I'll surely wait for that. Aside from the tasting menu, we also ordered additional items on the menu. The first of which is the Egg Cocotte.This is my first time to encounter this type of egg dish, on the center of the hardboiled egg white was a yolk mixture. The yolk center was so smooth and creamy plus it had delicious subtle flavors. I'm not sure what the ingredients were but I tasted cheese, an herb and white wine. Looks so simple and tastes so good. I would have wanted the pasta in the Seafood Pasta to be more firmer. Still, I love how simple and rustic the pasta dish is, fresh shrimps, garlic, chopped tomatoes, olive oil, parsley make up the dish. I found myself mopping out every little piece of morsel out of the plate. I enjoyed dinner so much that I knew I had to go back. When I did, the resto was offering a different tasting menu, the resto changes it's tasting menu every so often. Even before I got to open the menu, Christophe got hold of it and said, "you won't be needing this." I happily let go of the menu and told him to take care of me. For that evening, they were serving a French Riviera tasting menu. For the appetizer, a Prawn Ceviche with pieces of crostini was served. I think this came as complimentary since it wasn't listed on the menu. I've eaten different versions of ceviche before and each one has a common denominator, the strong sour mouth pucking sensation. This is due to the use of either vinegar or any citrus fruits. Christophe's version is the most pleasant and smoothest I've tasted. Though it also has a squeeze of lemon in it, it didn't have the sour mouth pucking feel, it was deliciously mellow that taste of cilantro and basil. More importantly the chopped shrimps were so plump and fresh. Something to die for. The Mediterranean Trilogy starter consists of a slice of Pissaladiere, Egg on Ratatouille Bed and Fish Pate. The fish pate was fresh, smooth, creamy and tasty. I really enjoyed the runny yolk on the egg as the yolk added creaminess to the perfectly stewed tasty vegetables. It was my first time to taste Pissaladiere, Christophe told me it's French style pizza. The Pissaladiere had caramelized onions, garlic, olives and anchovies. As I took a bite out of it, the sweet aroma and taste of caramelized onions filled my senses, I didn't even have to chew on it as the stewed onions just melts in your mouth. For onion lovers like me, I'm pretty sure you'll also love this savory pie. After trying out the Petits Farcis main course, I looked it up and found out that Christophe's version was special. Usually the regular version uses one kind of stuffing for the different vegetables, the one I tried has different fillings for each vegetables. The eggplant has pork, the sweet tomato has beef and both the zucchini and bell pepper has seafood stuffed inside. Served with white rice on the center and a lemon on the side. Christophe told me to squeeze the lemon on the breadcrumb coated stuffed vegetables. He also pointed out that the breading had just a slight crunch so that I'll be able to enjoy the textures of the meat and vegetables. I squeezed the lemon all over and took a bite out of each vegetable, everything tasted so clean and fresh. I imagined myself eating this on a clear sunny day staring out to the sea, it's the perfect dish for it. 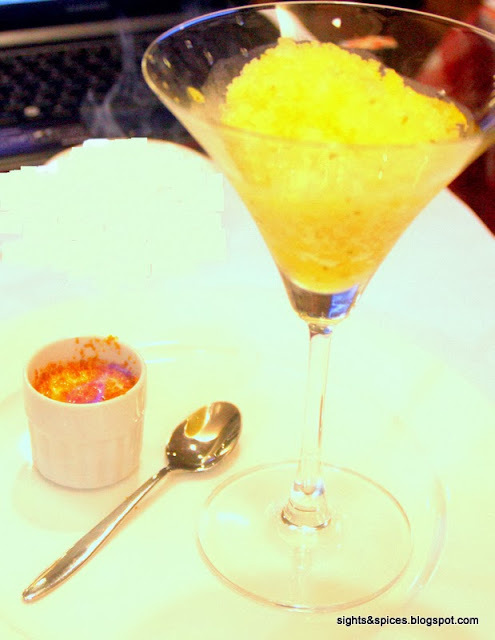 To cap it all off, a Orange Granita and a 'still on fire' creme bulee was served for dessert. Served on a tall martini glass, the granita had freshly squeezed sweet orange juice and basil leaves, so refreshingly delicious. The creme bulee was so creamy and had just the right amount of sweetness, I wanted more of it. Of course a classic French Bistro wouldn't be complete without wines and aperitifs. Cafe De Paris offers wines by the glass, by the carafe and by the bottle. They carry mostly French wines and one thing I noticed is that they don't really marked up their wine prices too much. On both occasions that I was here, I ended up staying way past closing time. I found myself chatting and drinking with Christophe, Jean-Louis, the staff and fellow dinners. Christophe and Jean-Louis being great hosts made sure that we had enough to drink, their love and passion for good food is so evident. Every once in a while, you'll find a special restaurant. A restaurant that serves fine and exquisite food that won't cost you an arm and a leg. A restaurant that you can go as you please, be casual as you can be, nothing fancy and still be welcomed warmly. A restaurant that feels like more of a home and you being treated as it's guests. Cafe De Paris is that special restaurant to me, it's a restaurant that I'll surely frequent whenever I want to eat really well, drink good wine and have good conversations. Bump into me in here and I'll gladly share my bottle of wine with you.